We have been trying to feed little man peaches for a few days and he just doesn’t like them. He’ll turn his head away and close his mouth. But I already had mashed up peaches to feed him and I didn’t want them to go to waste. Tonight we tried feeding them to him again and no luck. He didn’t want them. However, he did want dad’s sweet potato chip. 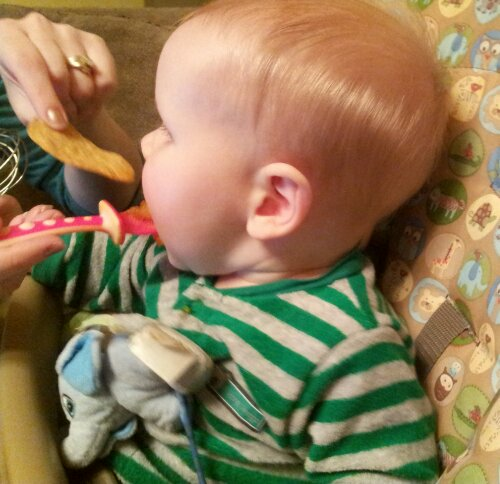 So dad grabbed a chip and a spoonful of peaches and when little man opened his mouth to eat the chip, he put the peaches in. Little man was tricked into eating all the peaches I had prepared. Dad was a genius and we will be waiting a while before trying another batch of peaches. 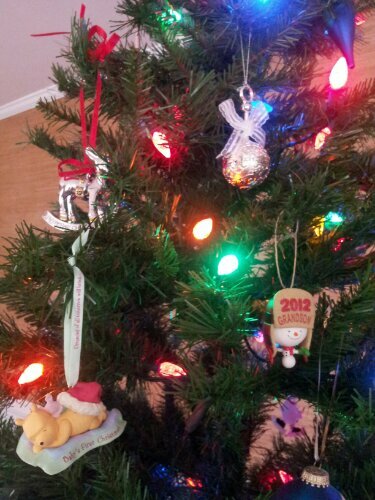 My son now had a prominent place on our Christmas tree. These are his “baby’s first Christmas” ornaments. My favorite is the silver rattle but that could be because it is the one from me.